The out MSNBC anchor was flawless as he anchored the newscast that made Lester Holt, Brian Williams, Tom Brokaw and others legends at NBC. NBC News pulled out its Nightly News anchor chair Saturday night for Thomas Roberts, the rugged and dashing MSNBC host who came out when it was still considered career suicide. With millions watching, Roberts made history, as the first out anchor of an evening newscast on any of the major TV networks. His lead story was the controversial remarks by Donald Trump, insulting the war record of the 2008 Republican presidential nominee, Sen. John McCain of Arizona. Flawless, with his steely blue-eyes matching a trim-fitted pinstriped suit, Roberts waltzed through the 30-minute newscast with a firm but casual ease that attests to his experience both behind the anchor desk and as a journalist. “He made it look easy,” one fan commented online. In 2012, Sam Champion was the first to come out on a morning network news program, followed by Robin Roberts. Thomas Roberts’s usual home, on the cable network MSNBC, boasts Rachel Maddow as its groundbreaking host; CNN has Anderson Cooper, and The Weather Channel has Champion as both host and managing editor. In an interview earlier this year, Roberts told The Advocate how he came out to his mother when he was 27. He is married and has a huge following on social media, where accolades and well wishes poured-in. In addition to hosting MSNBC Live With Thomas Roberts, he also anchors OutThere, a weekly broadband program on MSNBC’s Shift website that focuses on LGBT issues. It looks like that call finally came, and Roberts certainly gave NBC viewers a reason to watch. 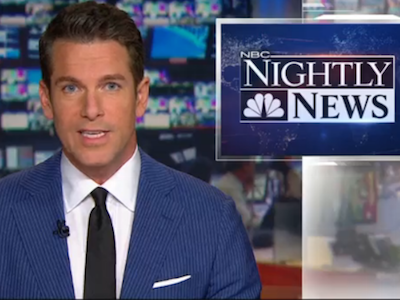 Watch NBC Nightly News with Thomas Roberts reporting below.